I recently posted the video for The Tragically Hip's new single, "Yer Not the Ocean". There's a suspension bridge featured in the video that I'm trying to identify. A couple of commenters think it's the Capilano Suspension Bridge in North Vancouver but I disagree. 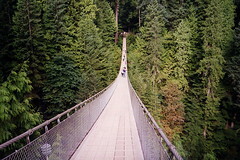 Below is a picture of the Capilano Suspension Bridge and beside it is a screen cap from the "Yer Not the Ocean" video. As you'll see, they're two different bridges. Unfortunately, Ontario tourism wasn't clever enough to post their "There's No Place Like This" ad on YouTube so I can't share it, but if you've seen it you'll have seen a suspension bridge that might just be the one in the Hip video. If you know where this bridge is, let me know in the comments. Speaking of Ocean songs and videos, Pearl Jam's "Oceans" is still awesome. Here's the video. Could it be the Suspension Bridge at Scenic Caves in Collingwood? I've heard this theory as well, but it doesn't look like this one. Fine work Mike, we will get to the bottom of this. That makes the first 3 songs off World Container singles, can we expect Fly next? Fantastic album! I see that the bridges are different but I don't know about Collingwood. You see mountains at the start of the video and is Blue mountain really that big? I'm not good w/ bridges, sorry Mike, but did you know Peal Jam covers The Who's "Love, Reign o'er Me" for the movie of the same title w/ Adam Sandler & Don Cheadle out today? Ha, I just heard the radio commercial for it. As previously heard at Toronto Mike, Love, Reign o'er Me. My first thought was that is was the Lynn Canyon suspension bridge in North Vancouver. Similar to the Lynn Canyon suspension bridge in North Vancouver, but different. Buntzen Lake Suspension Bridge near Vancouver (NE of). I posted more info as a "comment" under the picture of the screen cap on your Flickr site. So it wasn't filmed in North Vancouver - just northeast of there. Patrick, that's it. Another mystery solved! I'm pretty sure it's Lynn Canyon Suspension bridge in North Vancouver. I've crossed Lynn Canyon hundreds of times and it's looks exactly like it.